Praying Children | MWAH! S&P Shakers Figurines | One Price Low Flat Shipping! From Westland Giftware's Mwah! Salt and Pepper Shakers Collection, Praying. Made of ceramic with glossy finish. Measures 3.75" high. Hand wash only. 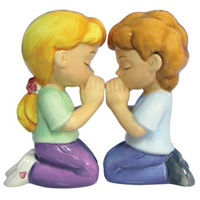 This adorable 2 piece salt and pepper shakers set features two children praying. A strong small magnet holds these kids together. Need a little salt? How about some pepper? Mwah! magnetic salt and pepper shakers will have you shaking in no time! Kissable, cute, and irresistable, there's a place for Mwah! in every home.